Prothane bushings will hold their shape when rubber would be crushed and will keep your rear axle stable long down the road. 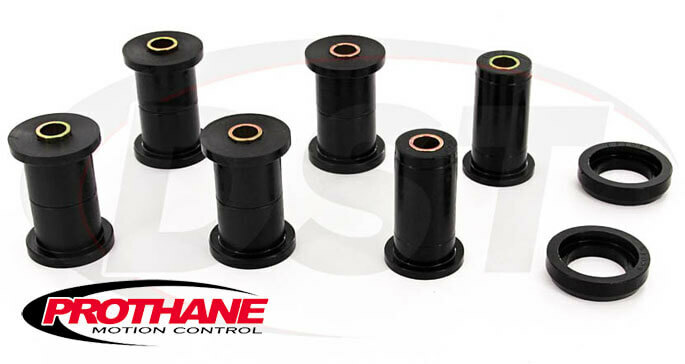 Polyurethane Rear Leaf Spring Bushings from Prothane are a more durable aftermarket replacement for the original rubber bushings and will hold your rear axle in alignment, keeping you moving straight ahead. Find the Leaf Spring Bushings for your vehicle below. If you have a live rear axle then worn leaf spring bushings can actually affect the direction your vehicle goes when you hit the gas. The rear leaf springs help locate the rear axle, so when the bushings holding the leaf spring in place hollow out your axle's alignment can become unstable. This means awkward thrust angle, steering wander, and scrubbing wear on the tires. Whether it's a farm truck hauling cattle down Hwy 377, a weekend mudslinger, or a high-horsepower drag machine, worn rear leaf spring bushings can hamper performance. These rear leaf spring bushings are manufactured with polyurethane which doesn't flex like rubber and is much more durable. Prothane bushings will hold their shape when rubber would be crushed and will keep your rear axle stable long down the road. Covered by a Lifetime Warranty, these bushings won't be affected by road grime, salt, or other elements that degrade rubber. So, take a look at these Made in the USA rear leaf spring bushings and keep your vehicle moving straight!